I'm running 10 threads in parallel with ramp up time 20 sec each and loop 1000 to achieve the same. But the issue here is my threads are not taking unique data set. Whereas my backend HTTP URL expecting unique string for each http hit. Now I have tried with the below approaches. 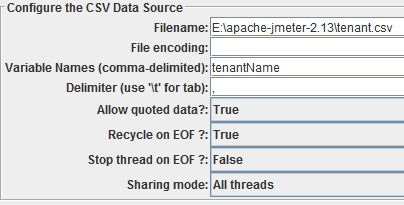 Single CSV data set config with 10000 unique values and all threads in thread groups are reading the same data. Using BeanShell preprocessor to call a java method and generate unique pattern all the time win HTTP Request sampler. Now none of the above approaches works for me. While running the test plan after some point of time 2 threads are trying to use the same data and hit my HTTP url. And I'm getting conflict error from http response. My error count keeps increasing. Now I really don't understand how these 2 treads trying to hit http with same data? Can some one please explain the issue and help me to set the correct test plan configuration. Beside all the suggestion from Ubik and DmitrT, I would put the CSV configuration element OUTSIDE the thread group. Let me know. If you need to send unique data which can be random I believe that __UUID() function can help. It generates random exclusive GUID structures each time when being called and seems to be exactly what you're looking for. The CSV approach is Ok, but how did you configure csv dataset and put it in plan ? Ensure you set "Recycle on EOF" to false to ensure no data is reused. Can you show this ? 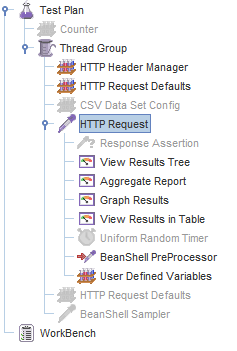 Can you also show HTTP Request content ? Though I am too late for the question, I thought someone might find it useful. Assign min and max value for that variable. Please make sure the difference between the min and max is big so that there will be less collisions. I have also had the same issue with a User Defined Variables element. In it, I created a UUID and assign it to a variable. I was expecting each thread to generate a different UUID, but this was not the case. Solution (which worked for me) Add a Beanshell Sampler. In it, generate the unique value such with a UUID and use the put method to store the value in "vars". Each thread will execute the code and have its own unique value. Not the answer you're looking for? Browse other questions tagged java multithreading jmeter load-testing or ask your own question. 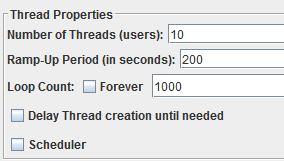 Is there a way in JMeter to start threads at set periods of time?